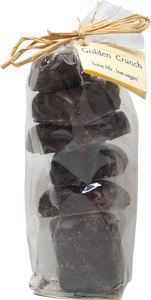 It’s difficult to describe, but these chocolate covered treats pack a lot of flavor into each bite! Crunchy sweet chunks of what we best recall to be very similar to “fairy food” are drenched in rich vegan dark chocolate to make for a treat unlike anything else. 5.3 oz (150g) package is $6.99. From Anonymous of Raleigh, North Carolina on 11/29/2012 . I change my previous review, the price has been reduced from $9.95 to $6.95. This is awesome, and I am in love with it. Great price and delicious sea foam. If you like 'Crunchie' chocolate bars, this is the bite sized version. From Marjorie of Ajax, Ontario on 3/13/2012 . Perfect, little 'Crunchie' bites, but better...because these are vegan. From Kim Ward of Vancouver, British Columbia on 1/1/2012 . My non-vegan boyfriend really likes these. I think I would prefer them with milk chocolate instead of dark chocolate, but they are still really good. From Jennifer Clark of San Francisco, California on 3/11/2011 . I love sea foam and am thrilled that there is a vegan version, just wish it wasn't so expensive. The couverture chocolate is dark and not too hard or bitter like some dark chocolates. The sea foam/sponge is super light and crispy, melt-in-the-mouth delicious. From Anonymous of Raleigh, North Carolina on 9/23/2010 . I enjoyed this product, as it reminded me of the one I liked as a kid (we called it sea foam). It tastes just like it. It is easy to eat the whole bag in one sitting, which is expensive to do (and probably not the best for the health). But the taste is great.